Lithium batteries were introduced relatively recently in comparison to lead- or nickel-based batteries, which have been around for over 100 years. Nevertheless, in the space of 20 years, they have acquired a considerable market share – particularly for the supply of mobile devices. We are still a long way from exhausting the possibilities that they offer. Numerous projects will undoubtedly further improve their performances in the years to come. For large-scale storage systems, other types of batteries are also worthy of consideration: hot batteries and redox flow systems, for example. 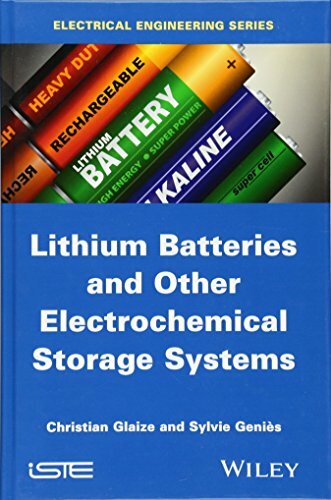 This book begins by showing the diversity of applications for secondary batteries and the main characteristics required of them in terms of storage. After a chapter presenting the definitions and measuring methods used in the world of electrochemical storage, and another that gives examples of the applications of batteries, the remainder of this book is given over to describing the batteries developed recently (end of the 20th Century) which are now being commercialized, as well as those with a bright future. The authors also touch upon the increasingly rapid evolution of the technologies, particularly regarding lithium batteries, for which the avenues of research are extremely varied. 1. Breakdown of Storage Requirements. 2. Definitions and Measuring Methods. 3. Practical Examples Using Electrochemical Storage. 4. Introduction to Lithium Batteries. 5. The Basic Elements in Lithium-ion Batteries: Electrodes, Electrolytes and Collectors. 7. Present and Future Developments Regarding Lithium-ion Batteries. 12. Other Types of Batteries. Christian Glaize is Professor at the University of Montpellier, France. He is also Researcher in the Materials and Energy Group (GEM) of the Institute for Electronics (IES), France. Sylvie Geniès is a project manager at the French Alternative Energies and Atomic Energy Commission (Commissariat à l’Energie Atomique et aux Energies Alternatives) in Grenoble, France.